Bashir Jama is Director of Director of Soil Health at the Alliance for a Green Revolution in Africa (AGRA). He is a soil scientist who leads a program to help increase food security and improve livelihoods among smallholder farmers in 17 sub-Saharan Africa countries by promoting the use of crop-boosting practices such as integrated soil fertility management. Previously, Jama was a policy advisor for Agricultural and Rural Development with the United Nations Development Program in New York. Jama also worked with the government of Kenya on renewable energy technologies and, for over 19 years, with the World Agroforestry Centre in Nairobi, Kenya as a principal scientist and regional coordinator for the eastern and central Africa region. He has also served on several international expert committees, most notably the U.N. Millennium Project Task Force on Hunger. 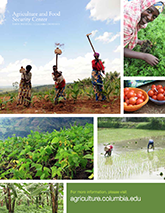 Jama has conducted research and published extensively on agroforestry technologies, particularly on integrated soil fertility management strategies for smallholder, low-input systems in sub-Sahara Africa. He has also written about resource management and conservation strategies for drylands. Jama holds a doctorate in agroforestry from the University of Florida at Gainesville.